This might be weird to make a parallel, but rain is kind of like sewing to me – it’s refreshing, relaxing, beautiful, sometimes messy, but always the water for creative growth. So why just stay inside on a rainy day?! Perhaps it wasn’t the best idea to go out in a pouring, thundering rainstorm in a white dress (of all things, va voom!) but I didn’t want the wet weather to ruin my plans for wearing my newly finished project that weekend. The print does remind me of raindrops, after all, trickling down, beading up as they occasionally do, while they take their gravity guided course. This was my first light colored, early summer worthy garment that I made for this year. It is a Burda Style dress with subtle, but interesting design features that was as easy to sew as it is easy to put on, all of which I really appreciate. This might not be my best dress for this year, but it is a comfy, different, pretty dress that is versatile…and it’s out of my favorite material, rayon! NOTIONS: Nothin’ but white thread, a small scrap of bias tape, and a hook n’ eye! TIME TO COMPLETE: The dress was whipped up one afternoon, May 25, 2017, in about 5 hours! I have been seeing this style of a loose, knee-length dress with a side seam attached waist tie offered here and there through other pattern companies throughout this year (see New Look #6519 for one example), but Burda did it first in 2016 with this pattern. In my opinion, I like this version the best, out of all the look-alikes I have seen. And yet, I am not used to a dress that does not have a whole lot of fitting, so even though I wanted to whip up a version of this the minute I saw the pattern on the cover of the March 2016 magazine, I was unsure. With the dress pattern simmering on the back burner of my project queue, it eventually won out, as I suddenly decided this spring season to cave in when I saw what I (finally!) felt was the right fabric for the design. All the fullness is in the front. 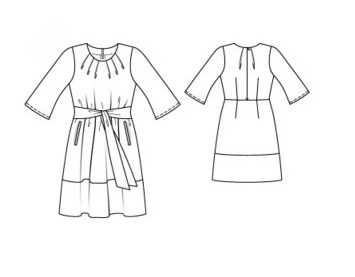 This includes the fanned out pleats in the neckline and the excess which allows this to be a pop-on, no closure dress which is pulled in by the waist ties. However, the back is so slim, trim, and fitted with darts, with a shaped waistline and small knife pleats at the neckline for shoulder freedom – it’s like two different dresses front and back! The wrap-around bottom band unifies it all in my mind. Rain water flows horizontally for a city dweller like me when it’s rushing through a street gutter, so the bottom panel has the blue “raindrops” running opposite the rest of the vertical direction on the body of the dress. I also choose the same horizontal layout of the ‘rain print’ for the set-in waist ties, like a little rivulet running through my middle. (I know I have a weird rhymes and reasons for my sewing choices sometimes! Whatever feels right inside!) The print is so low-key, this play on thought process and the direction of the print is not as apparent as I would like, and yet I think something dramatic (like bold colored crazy stripes) would have been too much…so, I’m generally happy with it the way it is. The best part to the dress is what I changed, in my opinion! I extremely simplified the design by eliminating the center back zipper, opting for a front neckline closing instead. It is just a strip of wide bias tape, stitched in a loop, snipped through and turned under with a tiny hook-and eye at the top corner hidden under the facing edges. Besides making this dress quicker to sew and get dressed in, the front slit placket keeps the closing easy where I can see it, as well as freshening up the very high and conservatively designed neckline. I decided after cutting out from the fabric to do this closure-free adaptation, otherwise I would have cut both the bodice back piece on the fold to eliminate the seam where the zipper was designed to be. It was still a good thing that I cut this dress pattern out the way I did because I had enough left over to squeeze out a much needed new pillow case for my side of our bed! I’ve never seen sleeves like these that have a shoulder cap with a shaping dart to get a curve over this angle of the body. The darts start from the shoulder seam end and taper into the middle of the upper sleeve. This is very interesting and different, yet not as effective in shaping after all as I would have thought. However, it’s always nice to have a change and try something different! In hindsight, I now wish I would’ve checked ahead of time and adjusted the overall fit of the shoulder and sleeves. The shoulder seam is a bit short compared to the somewhere in between generous and spot-on fit of the rest of the dress. I also wish I had given myself more reach room under the arms. 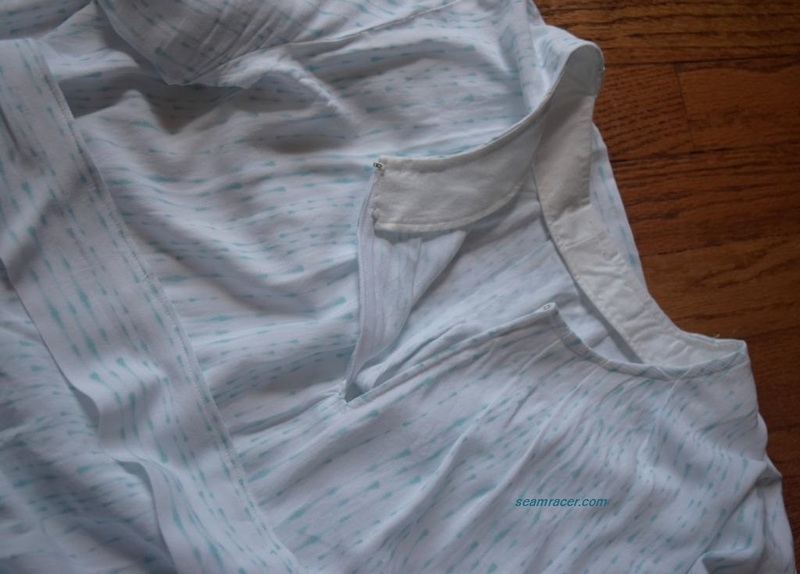 If you make this pattern, I suggest you raise up the side seams and make the sleeve seam longer at the armscye (maybe by about ½ to 1 inch) to have full movement for yourself. To more than make up for any ‘meh’ feelings toward the dress, I paired it with some awesome accessories that are favorites from my wardrobe. Firstly my necklace is from my beloved Grandmother’s jewelry collection, and it’s just so different – I love it. My shoes take the cake though. They are all leather, inside and out, and Clark’s brand so well made and so comfy. These are something I splurged and bought for myself (much to my mom’s dismay) with my birthday money, about 17 years back. Sorry mom, sometimes that monetary gift cannot be saved when a one-of-a-kind pair of shoes comes one’s way! 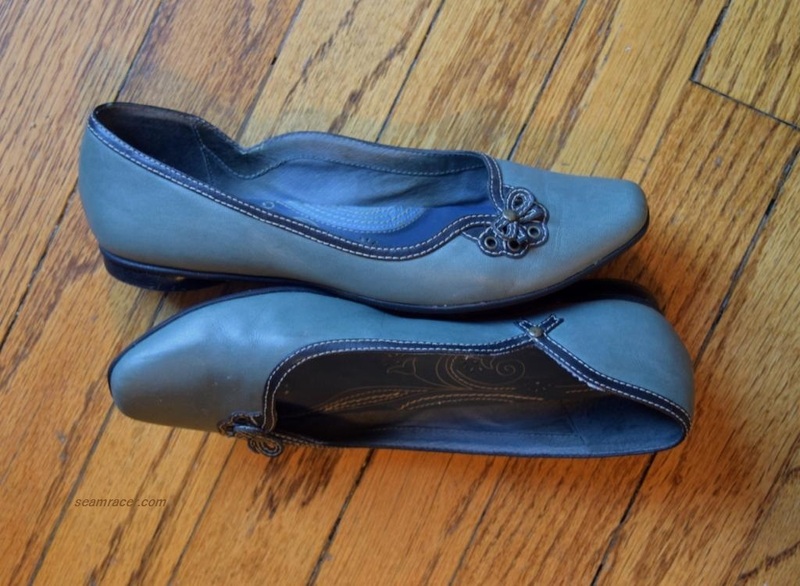 I think this was my first major indulgence in my taste for interesting shoes…and these take the cake. Why? They actually have jewels set into the bottom of the already decorative sole. Yasss! I must admit I do like to kick up my heels, cross my legs, and overall let the soles be seen when I wear these, judiciously I might add, but I do not save them…they need to be enjoyed! Hubby says these shoes remind him of the words in a song by Paul Simon, “People say she’s crazy, she’s got diamonds on the soles of her shoes.” Thanks. No, but this is not the only way I’ve accessorized it – every time I wear it (which is frequent) I have tried different jewelry, shoes, sweater (or jacket) combos, and even tie the belt differently. This dress is like the unlimited “I can go with anything” go-to dress that just keeps making me glad now that I made it. On to other tunes that I do like and cannot help but sing when I wear this dress –they are “Raindrops” of 1961 by Dee Clark, Enya’s “A Day Without Rain” and her “It’s In the Rain”, and finally (my favorite) Engelbert Humperdinck’s version of “Raindrops Keep Falling On My Head”. And then there’s the amazing “Isn’t This a Lovely day To Be Caught in the Rain” with Fred Astire and Ginger Rogers. I know there’s plenty of other popular classics which mention rain, but these are my personal picks! Just like a living thing cannot go on without water, just so I seem to survive in a different way on the creativity and self-expression that the outlet of sewing has to offer. This is why it makes total sense for me to combine rain and sewing in one project. I’m surprised I haven’t done this combo earlier! Perhaps this post can even encourage you to not stay inside on that rainy day, but get out and make the most of it…just don’t necessarily wear white in it like me unless you really intend to!